I wrote this script a long time ago when I was just starting to learn about networking basics. During that time, I came across a Python library that makes it easy to craft and manipulate network traffic at a packet level by the name of Scapy. Anyway, aside from searches for the phrase "How can you say you love her if you can't even eat her poop?" (oh yeah, I'm an SEO master), the majority of external search engine hits to my website come from people looking for this script. Therefore, I decided I'd spruce it up a touch, and repost it in all of its glory here. So without further adieu, gaze and behold! # There are two different ways you can go about pulling this off. #   - 2. Or you can be a cool kid and use scapy to make it look cool, and overcomplicated! A friend of mine asked me to write him a bot that would automatically poke back anyone who poked him on Facebook, so that's what I did. This bot doesn't make use of any of the actual Facebook APIs, but instead performs all of its actions by mimicking the behavior of an actual web browser. I designed it this way for three reasons. I was bored and enjoy a challenge. It takes me back to my days as a freelance spam bot developer. Working with official APIs can be messy when you have to deal with getting access tokens, and the possibility of having your access revoked if your actions are deemed excessive. So while it's not nearly as straight forward as working with the official API, mimicking a web browser does have its perks. Assuming you meet all the requirements listed above, all you need to do is run main.py Pokebot will ask for your Facebook email and password, as well as an amount of time to wait between checking for pokes. Once all of that information is squared away, Pokebot will run on a continuous loop until you tell it to stop. I put together a scraping bot for a website I frequent occasionally, but they got wise to my Python shenanigans after I released the source code (who'd have thought? ), so I had to step up my bot code a bit. After some tinkering I found that they had just blacklisted the user agent header I was using for the script, instead of doing something more effective like setting access timers between page requests, or getting strict on referer headers, or just banning my account. Since all they did was ban the user agent string I was using before, all I had to do was change it , and I was back in business. But in the long run this isn't really the best solution since they could always just ban the user agent header again. So instead I decided to throw together a quick Python function that generates a randomized, realish looking user agent header. base_agent = "Mozilla/%.1f (Windows; U; Windows NT 5.1; en-US; rv:%.1f.%.1f) Gecko/%d0%d Firefox/%.1f.%.1f"
I hope someone out there besides me can find a use for this. One of the major drawbacks to using a brute force attack to crack a password, is that it can literally take billions of years (if not more) to try all of the possible permuations of a user's password. One way to cut down on this, is to skip trying passwords that would be unlikely for a target user to have. (Things like 'aaaaaa', 'asdf7777772dn', etc) Gentle-Brute is a Ruby gem designed to generate only "English-like" words and phrases for more heuristic brute force password cracking attacks. An English-like word is a sequence of characters that may not necessarilly be an actual English word, but still adheres to the "rules" of English words. By only using these kinds of words and phrases when attempting to crack a password with brute force, it's possible to greatly reduce amount of time it takes to find a matching hash. What are the "Rules" of English-like words and phrases? Please see my article Building the Better Brute Force Algorithm - A Guide to Heuristic Password Cracking for a detailed explanation of this subject. 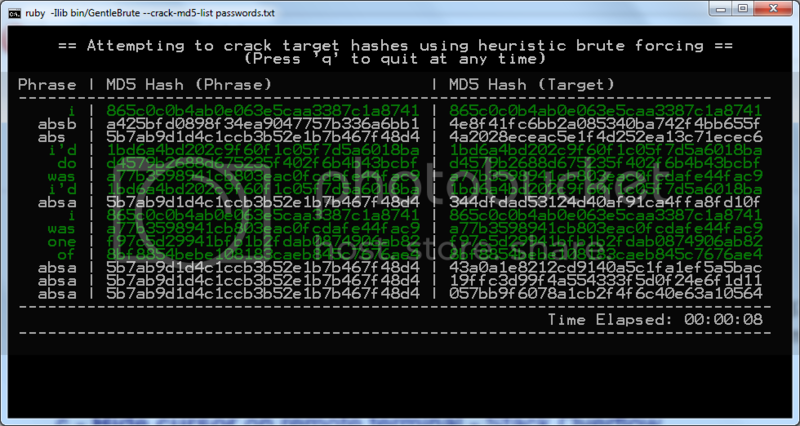 Gentle-Brute includes a handy dandy pre-written application (GentleBrute) for crackng MD5 hashes, or you can write your own custom password cracking programs. --cross-compare-crack      Cross compare brute force cracking times for a given md5 hash between GentleBrute, and regular brute forcing. Is there really a big difference in speed? This is a Python project I cooked up a month ago to automate the process of creating user accounts on phpBB forums. You can get the source code from my Github repository. Pydget is a Python powered application for (mostly) automating the process of downloading files from various file hosting websites. Also, Pydget was and still is developed primarily on an iPad using nano and a copy of Python compiled to run on iOS. Pydget - Automate (for the most part) downloading files from file hosting websites! before beginning the next download. --save-to path  Save downloaded files to a specific folder. Download Pydget from my Github Repository! Decaptcher is a website that offers automated CAPTCHA image solving for the price of a fraction of a penny per image. They offer round the clock CAPTCHA solving, which they claim is all done by humans over on their end, which leads me to believe that there is some massive sweatshop somewhere in India wherein there are several hundred small children being forced to solve CAPTCHAs all day. Oh well, it makes for a great tool for writing bots. Decaptcher doesn't have an official Python API, so I cooked up my very own based off of their terrible documentation, enjoy! This is a small script for generating random, unique, and realistic looking usernames on the fly. You will need to have both adjectives.txt and nouns.txt in the same directory as this script for it to work. The title pretty much says it all, this script will generate Pascal's triangle to however many lines you tell it to. Operation Sharada Sharada is an application designed to retrieve all proxies listed on Saimar.ru. At launch, it determines what is the last available page of proxies, and then iterates over that range retrieving the proxies from each page. All results are then dumps the results for each page into a file named proxies.txt. Operation Sharada Sharada is designed to be used either as a stand alone application, or as a module in other applications. If you take a look under the __main__ section of the source code, you will see an example implementation of Sharada. This program generates a look-and-say sequence to however many lines it's instructed to do. Operation Jupiter Jazz is a 4chan image dumping tool. When launched, you will be prompted to select an image board to upload to, as well as given the option to provide a custom name, subject, and/or email address. With each post, the bot also appends a randomly chosen quote from either Anime Lives, or a static list of quotes located at the top of anime_quotes.py. This is to avoid being flagged for flooding, and to keep the posts interesting. As of version 1.3, the current one, Operation Jupiter Jazz now supports full control over name choosing. You can post as anonymous, use a tripcode, or whatever else you can think of to shove in the name field. This is just a little simon game I wrote on my way to Utah for my fall semester of college. It's not nearly as neat/well coded as my other projects, but it's still fun. My high score was 240. This is a multithreaded ARP cache poisoner capable of poisoning a single host or range of hosts based on command line arguments. This is a port scanner I wrote back when I was just learning how to use the threading module. It scans a single host for all possibly opened TCP ports. The output on it is pretty neat IMHO what with all the carrige returning and whatnot, so check it out. Another response for yet another program challenge on Information Leak. This program prints the numbers from 1 to 100. But for multiples of three prints "Fizz" instead of the number and for the multiples of five prints "Buzz" and fornumbers which are multiples of both three and five prints "FizzBuzz." The following piece of code was an experiment with lambda functions, and seeing how short I could make the code. This is a Python module that can play noises on a motherboard's internal speaker on computers running Windows. 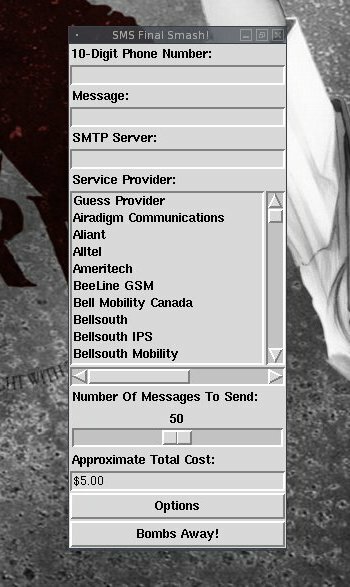 This is a spiffy drop-in Python module for interacting with the CDYNE SMS Notify! web API. For more information, see the CDYNE SMS Notify! website. Add the module somewhere where your project will be able to get at it, and use it like so. message = "This is a test message"
Download from my Github Repository! Operation Image Faerie is an image scraping suite that currently supports five different anime related websites. These websites are Danbooru, E-ShuuShuu, Konachan, Moe Imouto, and Sankaku complex. Each scraping application includes the option to filter out NSFW pictures, and downloads images in parallel.